I picked this up at the library as a consolation since I couldn't find what I really wanted. Ironically, I had checked this book out before but never read it, a victim of library gluttony. I am very happy that I now have finally read it. 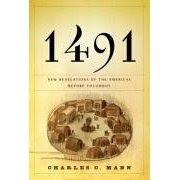 1491 by Charles C. Mann seeks to deliver us from white presumption and ignorance. The subtitle is "New revelations of the Americas before Columbus." His thesis, simply, is that the New World had a massive population that was mostly wiped out by European diseases before Europeans ever settled here. He points out that modern genetic analysis of native immune systems (North to South) show vulnerabilities peculiar to their phenotype. It only takes one fishing boat from Europe with one sailor with measles or small pox somehow infecting one Indian trading with the crew, who then infects his village. Apparently, this happened in New England before the Pilgrims arrived. Europeans recorded villages of bones, unburied, scattered, untended, up and down the New England coast. So what is left to prove a large population? European records speak of abundant villages on the Atlantic Coast, up the Mississippi, and further South. Modern archaeology recognizes mound cultures in the North and Amazonian farming cultures in the South that were missed or denied in the past. It seems the archaeology suffers over and over again from out of sight, out of mind. The jungles of Mexico hide so well so many cities. Which leads to another issue. Undisturbed forests are a myth. They are a myth in North America, Central America, and South America, especially in the Amazon. Forests were cleared. Slash and burn was used intentionally and sometimes successfully and sometimes unsuccessfully. More than likely, the failures would have been learned from if invasion and disease had not halted most cultural development. I am familiar with much of the history he covers and I believe Mann did a great job. I learned a great deal more. However, he disappointed me a couple times. The first big disappointment is his explanation of the lost tribes theory, that the Europeans understood Indians to be the missing tribes of Israel. He called Judah the Northern tribe with it's capital in Jerusalem and Israel the southern tribe with its capital in Samaria, p. 143. Even if you don't know the Bible that well, anyone who looks at a map knows that Samaria is north of Jerusalem. My other gripe is the overreaching in his concluding chapter. He wants to give credit to the rise of libertarian government to the Iroquois nation in New York. He may have drunk too deep of Francis Jennings and could never shake the buzz afterward. His proposal is too grand to be tucked into the end of a book covering a much different topic. Perhaps that is his attempt to set up a sequel, which is fine in fiction like Harry Potter, but takes away from the accomplishment of this book. I wish he stayed on topic. This book, though, is told from a 1st person perspective. This is his journey of deliverance from ignorance and Anglo pride. Unsurprisingly then, the story meanders. I think it makes for a more interesting history book. I hope fellow truth seekers will also pick up this book. I just read the book and caught that same Judah/Israel north/south blunder... I wonder if he's been informed of it and is fixing it for future printings.